For those who know me my fear of the barber is a well-known fact. In many religions parting with one’s hair is a sign of devotion, showing a willingness to make a fresh start, leaving the old self behind, a symbolic re-birth. 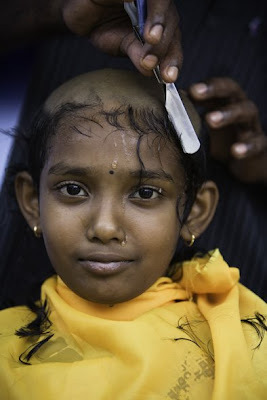 Like the girl in the photo, taken earlier this month at the Thaipusam Festival at the Batu Caves in Malaysia. If only it were that simple, even I might be tempted.